This is a very rich and creamy curry that goes good with any Indian bread. I prepared this baby corn curry for our weekend dinner. 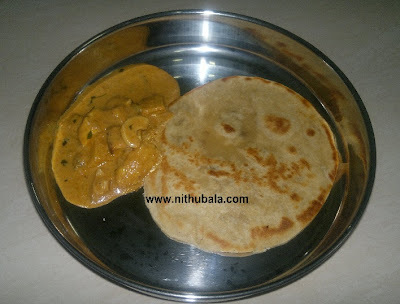 I served it with Chapathi. Heat ghee. Medium the flame. Add cashew ad fry till it turns golde brown. Now add raisin. Switch off the stove. Keep aside. 1. Soak almond and cashew in milk for an hour. Grind to a smooth paste. Keep aside. 2. Heat a tawa. Add butter. When it starts to melt, add paneer cubes. Fry the paneer cubes on medium heat till the colour turns to golden brown. Keep the fried paneer aside. 3. Pressure cook baby corn pieces with a little salt for 2 whistles (Not more than that). 4. Now, in a pan heat oil. Add ginger-garlic paste. Fry till the raw smell is gone. 5. Add oion and tomato. Saute till tomato turns mushy. 6. Add red chilly powder, garam masala, cumin powder, coriander powder, salt and sugar. Saute for few minutes on medium heat. 7. Add 1/2 cup of water and allow the contents to cook for five minutes. Switch off the stove. 8. Let the contents cool. Grind to a smooth paste. 9. Transfer to a pan. Add paneer and baby corn. Add 1.5 Cups of water. Let the contents cook for a five minutes. 10. Add nut and milk paste. Crush Kasuri methi and add to the contents in the pan. Mix well. 11. Switch off the stove when the contents starts to thicken. 12. Garnish with cashew and raisin. 13. Serve hot with Chapathi or any other Indian bread. Baby Corn Masala & Chapathi, Chapathi & Dhal goes to my own event "Healthy Food for Healthy Kids - Healthy Combo Meal for Kids", guest hosted by Sowmya. 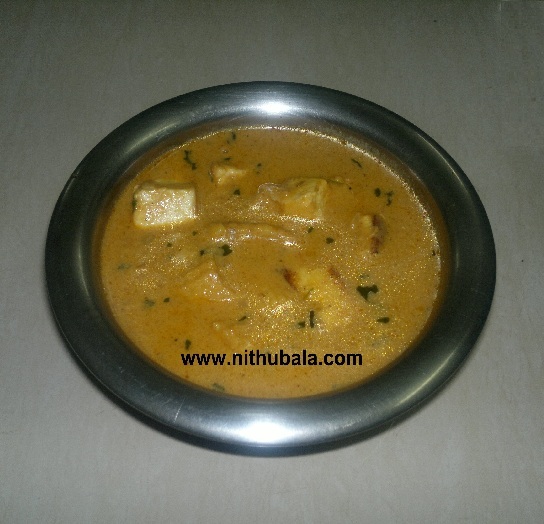 Thanks for linking this yummy dish to the event Nithu!! They look awesome!! super and yummilicious combo curry. Lovely combo meal dear. Never cook baby corn with paneer. yours looks fabulous. Sounds so yum dear :) Will definitely give a try!! Such a delicious masala,wish like finishing that whole plate. Yummy n creamy..Love this combo..
Curry looks so yummy..nice combination with roti or naan..